Minimum 35 words! Please offer in detail your experience with Glow. Short and inconclusive reviews will not be approved. This slot is available to be played exclusively on the Betsson AB casino brands (Betsson Casino, Betsafe Casino, SverigeAutomaten, NorgesAutomaten, Dhoze Casino, CasinoEuro). These being said, the slot has a great visual appeal and theme, nothing less than what is expected from a Net Entertainment slot. The slot game will look quite relaxing, offering a great play after a full day of work and agitation. The theme is one of the Northern Lights (or Aurora Borealis) with Celtic symbols. This game features Free Spins, Multipliers and Wilds. 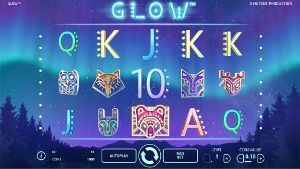 With a payout of 96.7%, Glow by NetEnt is a good choice for playing. Glow was reviewed by 1 users and received a 5 /5 .